A yacht wrecked by Hurricane Florence sits on its side after being washed into the grass along the banks of the Cape Fear River, near downtown Wilmington, N.C.
Maxine Locklear Amos is fortunate. The Lumberton, N.C., resident and member of the Lumbee Tribe suffered no damage from Hurricane Florence when it made its slow, destructive descent over the state in September, claiming lives and flooding properties. She also walked away unscathed from Hurricane Michael, which formed only weeks after Florence and also affected the Carolinas. But with many in the region facing a difficult road back to recovery, the 82-year-old has been hard at work along with other Lutherans at organizations large and small providing aid. “Our numbers are low, but we’ve got a big heart,” Amos said. She is the disaster response co-chair of St. Mark in Lumberton, the only Lutheran church in Robeson County, which typically attracts a few dozen members to services. St. Mark held a mold remediation class and has mold detectors available for church and community members to borrow, Amos added. Robeson County has one of the highest poverty levels in the country for a county of its size, said Carl Rosenberg, a guest supply pastor at the church. The county is home to the Lumbee Tribe, which has 60,000 members in Robeson, Hoke, Cumberland and Scotland counties, said Harvey Godwin Jr., tribal chair. He said Hurricane Florence destroyed 80 homes owned by the tribe. More than 70 percent of children in Robeson County live below the poverty line, and before Florence made landfall, many residents had not yet recovered from Hurricane Matthew, which devastated the region in 2016, said Rosenberg and Godwin. Lutheran Services Carolinas, which received a $4 million two-year government grant to provide disaster case management assistance following Matthew, assisted 1,650 people impacted by that storm. 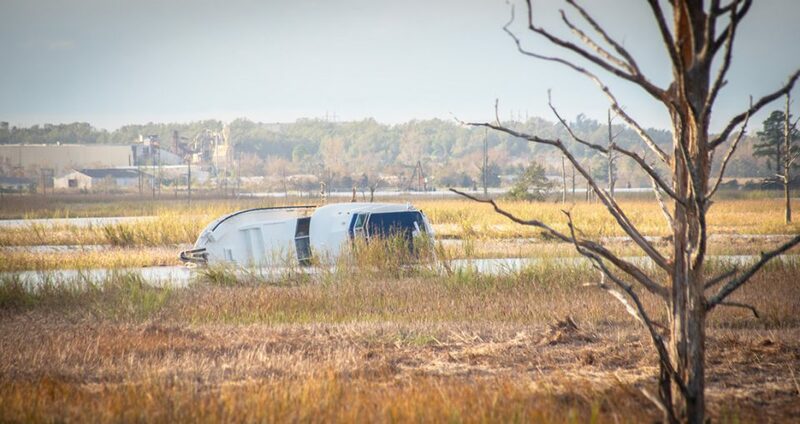 When Florence blew in, they still had more than 700 active cases, said Paul Dunn, director of the agency’s case management program in North Carolina. Lutheran Disaster Response, through Lutheran Services Carolinas, is supporting relief efforts in the worst-hit areas of North and South Carolina. The synod is dealing with humanitarian needs and damage to church properties like St. Andrew Lutheran in New Bern. Its sanctuary is unusable, its organ was destroyed and pews were warped, Smith said. Meanwhile, 17 families from St. Andrew don’t have a home anymore. “Some are insured. Some are not,” Smith said. Some congregations and homeowners are dealing with insurers who have denied claims, and others are facing high deductibles, he added. It’s important for Lutherans to remain involved, said Jean Horman, also a visiting supply pastor at St. Mark. “Acting in God’s love is the essence of what our faith is about,” she said. Knowles is a freelance writer and former religion and business reporter with the Chicago Sun-Times.